Riko top quality Cone Splitters are built in the EC, not China. They are specifically designed for the task of splitting wood. Unlike many others they are not just an hydraulic motor bolted to a spiiral cone! Riko Cone splitters are the ideal way to break down oversize timber for chipping or firewood processing. You can even break up roots in the ground so they can be removed with a finger tine on a small excavator. 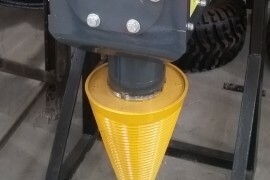 Riko top quality Cone Splitters are suitable for excavators, cranes, loaders, skid steers. Remeber they built in EC, not China. large range. Supplied from our nationwide depots.